Where : Catamount Trails center WIlliston VT. A great local, but abit of a haul from Maine. Sat, good start and with the second group (Bold and Aspolm check out quick...Mark Mc has a mechanical and is with us). I have good legs, but am lacking "5th gear" and my tech skills are off. On the last lap a group of us are racing for 6th place. Up through the STEEP whoop de doos, then down the fast grass descent. I cut a corner 6 inches too tight and T-BONE a huge rock that is in the grass, tires pops off, I yard sale down the trail...thought the collarbone was broke for sure...but dont lose any positions from my group (although I cant sprint for 6th). 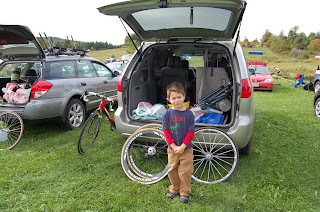 Finish, check bike over, quick cool down...and off to hang with the fam. Sun: slip a pedal at the start and am around 15th into the twisty's. 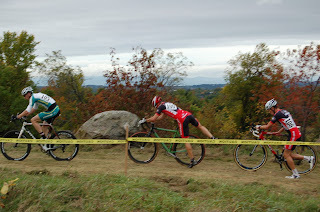 I am able to ride the STEEP up with the log hops, and pass a few dudes. This time our group is HUGE. Like 9 of us. It seems that me, Mark G., Stephan (teammate) and Todd C. are the only folks pulling (it's all grass and windy). 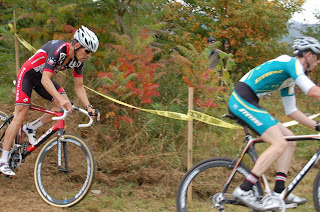 We dangle 15sec behind Steve P. from Ottawa the whole race. It is negative racing for sure. Finally with 3/4 lap to go I punch it on this false flat grass section, get a gap into the woods and keep it full throttle to the finish. 6th place, solo. So, all in all, a solid weekend. My form is ok. I lack that last gear and some tech skills, but know what needs to be done. 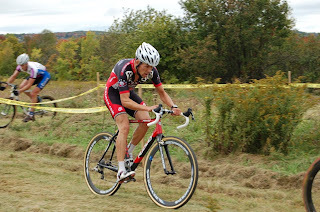 More importantly, I think I will have a front row start at Gloucester, and that is key on that course. Hope to see you all there! My pit crew, super cross fan and host for the weekend, Jack P.
With Steve P from Ottawa. At the top of the stair run up, following Stephan. accelerating out of the thick grass. Verge VT series race reports within 48 hours...maybe picks too.